Russia is reportedly considering selling China an export version of the Su-57 fighter jet. 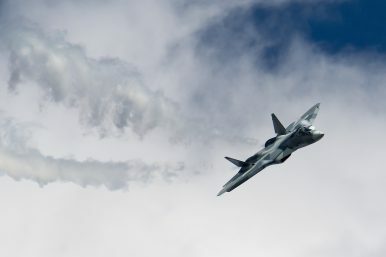 The Russian government is expected to offer the Chinese People’s Liberation Army Air Force (PLAAF) an export variant of the Sukhoi Su-57 fighter aircraft, Russia’s first purported indigenously designed and built fifth-generation stealth fighter jet, in the near future, according to Chinese media reports. The export variant of the Su-57, designated Su-57E, will reportedly receive export approval by Russian President Vladimir Putin in a few weeks, a senior Russian defense industry official said during a media briefing at the Langkawi International Maritime and Aerospace Exhibition in Malaysia, according to an IHS Jane’s Defense Weekly report. “China has recently taken delivery of 24 Su-35 aircraft, and in the next two years [China] will make a decision to either procure additional Su-35s, build the Su-35 in China, or buy a fifth-generation fighter aircraft, which could be another opportunity for the Su-57E,” the Russian defense industry official was quoted as saying. The Su-57E could be officially unveiled at the Dubai Air Show in November 2019. At the moment, there are 10 Su-57 prototypes undergoing various stages of testing and evaluation. However, nine out of the 10 the Su-57 prototypes are equipped with a derivative of the Russian-made Saturn AL-41F1S engine, the AL-41F1, an older aircraft engine also installed on the Sukhoi Su-35S Flanker-E, and not with the more advanced Saturn izdeliye 30 engine featuring increased thrust and fuel efficiency and fitted with 3D thrust vectoring nozzles. The Saturn izdeliye 30 engine, which enables the Su-57 to supercruise without afterburners, is not expected to be ready for serial production for a number of years. Consequently, it is likely that the new aircraft will fly with the AL-41F1, which would call into question the stealth capabilities of the aircraft. The aircraft’s sensor suite and other mission systems also reportedly continue to suffer from developmental issues. Furthermore, the Su-57 lacks other high-end low-observable design features. All of this calls into question Russian claims that the Su-57 is a fifth-generation stealth fighter jet in its current configuration. Similarly, the PLAAF’s purported first fifth-generation stealth fighter aircraft, the Chengdu Aerospace Corporation (CAC) J-20A multirole fighter has also been affected by development issues and reportedly suffered various technical problems in past years. For one thing, like the Su-57, the J-20A lacks an indigenously developed and designed next-generation high performance turbofan jet engine and continues to rely on older Russian-made models. The Russian Air Force is expected to take delivery of the first Su-57 by year’s end.